The third major installment in a cult RTS franchise created and developed under the watchful eye of the Microsoft company. The third part of an excellent real-time strategy game series continually developed since 1997 by Ensemble Studios. The first part was set in antiquity, and the second one in the Middle Ages. This time you can participate in the long-lasting conquest of America, so in the time period spanning from 16th to 19th century. The authors chose this, instead of other historical settings, not only because it follows what we have already seen in the previous games. The decision was also dictated by the fact that this was an era of unprecedented technological and military development. At its beginning, armies still used medieval-like gear, i.e. pikes, crossbows, etc. However, in time, wars started to be fought by soldiers armed with all kinds of fire weapons, from muskets through cannons. The key gameplay elements known from the first and the second Age of Empires – such as exploring areas covered with the fog of war, the economy layer, raising cities, or fighting your way to success – are present in this game too, although they went through numerous improvements. The design of the campaign also changed. Instead of rather short, separate scenarios, as known from Age of Kings, we have here story-driven campaigns, similar to those that appeared in Age of Mythology. Some of the events in which you participate, are based on historical facts (French and Indian War, or Latin American revolutions), however, most of them are invented by the authors in order to spice up the gameplay. 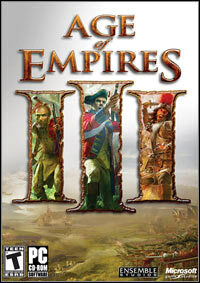 In total, there are eight playable factions in Age of Empires III for PC, among which there are: France, Great Britain, and Spain. Each of them is unique and has a number of characteristic features. For example, England has a very strong economy, shorter construction times, as well as an excellent unit – musketeers. In turn, the French have it easier to form alliances with the Indians, and can brag a special type of citizen, the so-called “Coureur”, who may, if needed, serve as a light infantry unit. The game was created with a 3D graphics engine (DirectX 9.0 and Shader 3 support), which in fact was taken from the previous production of Ensemble Studios – Age of Mythology. Besides, the developers also used Havok physics engine, known from numerous action or FPS games. This is the first such case when it comes to RTS genre. Thanks to that, the in-game battles, with hundreds of units involved, look very spectacular (ragdoll effect). Age of Empires III for PC offers both single player and multiplayer modes. Game score 8.535 / 10 calculated out of 5077 players' votes. Expectations before the premiere: 9.6 / 10 calculated out of 242 players' votes.